In his book “Choose the Life”, Bill Hull puts forth a challenge for Christ-likeness in this world. The call is to believe what Christ believed, live as Jesus lived, love as Jesus loved, serve as Jesus served and lead as Jesus led. It is a call for transformation! This is a call for men and fathers to be transformed, to step up as the leaders the next generation needs. 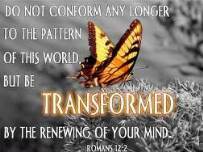 Transform your mind by renewing your mind and believing what Christ believed. The Truth Project produced by Focus on the Family several years ago posed a gut-check question, “Do you really believe that what you believe is really real?” The Word of God, and more specifically the Word become flesh in Jesus the Christ (John 1:1-2,14), provides the foundation for belief. Transform your character by staying under the influence of the Holy Spirit and living as Jesus lived. Do not be under the influence of wine, or the world, but be filled with the Spirit (Eph.5:18). This requires taking an inventory of what you watch, listen to, read and generally spend your time doing. If all does not complement your personal, passionate relationship with Jesus the Christ, submit to the Character you want to emulate. Transform your relationships by setting right priorities and loving as Jesus loved. Love the Lord your God with all your heart, soul, mind and strength, and love your neighbor as yourself (Mark 12:30-31). Jesus prioritized love for His Father through prayer and worship daily and exhibited His love for others by never judging anyone. Seek understanding of the love God has for us - He sent His Son to die for us while we were still sinners. Accept forgiveness and be forgiving. Transform your service by working for the Lord in all you do and minister as Jesus ministered. “Now that I, your Lord and Teacher, have washed your feet, you also should wash one another’s feet. I have set you an example that you should do as I have done for you.” (John 13:14-15) Start where you are, use what you have and do what you can. If the Lord grants you a glimpse of His glory in the process of ministry, embrace the blessing. If He does not, consult with John the Baptist, Jesus’ disciples or Paul and focus on an eternal perspective. Transform your influence by striving toward Christ-likeness and leading as Jesus led. You are not to conform to the pattern of this world (Rom. 12:2). Rather, you are to be conformed to the likeness of His Son, that He might be the firstborn among many brothers (Rom. 8:29). Jesus walked in Truth and reflected grace, glorifying the Father in the tension that exists between those two. As you walk in absolute Truth, you will be a God-glorifier and an influence for Christ with a generation enamored by relative truth. Practice daily discipline of time in prayer, scripture, worship and study of God’s word. Find a group of “battle buddies” that will love you and you can love, in a manly kinda way. Commit to be more like Christ today than yesterday, more tomorrow than today. Prayer: Lord, You are an awesome God. Thank You for the grace in my life that is the forgiveness of sin through Your Son, for a new self upon His resurrection and new power with the indwelling of the Holy Spirit. Grant me boldness and confidence to be transformed for Kingdom work in this world - to believe what Jesus believed, live as He lived, love as He loved, serve as He served and lead as He led. Transform me into the man, husband and father You expect me to be and that the next generation needs. Amen. A faithful father commits to being more Christ-like today than yesterday.